Identification: Small, streamlined torpedo shaped fish. Its common name is derived from the presence of two to four, but usually three sharp spines on the back forward of the dorsal fin. Dorsal fin is broad and has 10-14 soft rays; caudal fin contains 10 rays. Freshwater populations vary in body shape depending on the type of habitat it occupies. Fish inhabiting surface waters (limnetic form) tend to exhibit slender bodies with narrow mouths, long snouts, and large eyes. Benthic fish are deep bodied with a small eye and a wide, terminal gape. Pelvic fin is reduced to a sharp spine and a small ray. Gill rakers are long and slender, with 17 to 25 on the first arch for freshwater forms. While the oceanic form of G. aculeatus has up to 30 or more lateral bony plates on each side of the body as well as a pelvic girdle and lateral line with microscopic pores, these features tend to be reduced in freshwater forms. This species can be differentiated from other species in the genus by a crenulated posterior edge of scutes and by a set of scutes forming a lateral keel on the caudal peduncle. In populations that co-occur with predatory fishes, dorsal and pelvic fins tend to be longer, and other anti-predatory features such as dorsal spines, the lateral plate, and the pelvic girdle tend to be more prominent (Grand 2000, Marchinko 2008, Reimchen 2000). Coloration is generally cryptic, with mottled brown-green barring on the upper side of the body and a white, silvery, or yellow underside. Sides are pale and fins are often spotted with dark dots. Breeding males develop a vivid blue-green coloration with blue or green eyes and the breast region develops an intense red-orange coloration (Baker et. al 1995, Bell et al. 1994, Cresko et al. 2007, Day et al. 1994, Morrow 1980). Size: Usually between 3 and 8 cm long, average length about 5 cm (Scott and Crosman 1973). Maximum reported length 11 cm (Muus and Nielsen 1999). Native Range: Range in North America extends from Cape Fear Estuary north to Hudson Bay and Baffin Island, and along the west coast from Alaska and British Columbia to southern California (Scott and Crossman 1973). This species also occurs in Europe, Iceland, Greenland, and along the Pacific coast of Asia. Freshwater populations are distributed along the coast of the Mediterranean and in inland waters across Eastern Europe to the Baltic Sea (Page and Burr 1991). Gasterosteus aculeatus is native to the Lake Ontario basin, below Niagara Falls (Stedman and Bowen 1985). Table 1. States with nonindigenous occurrences, the earliest and latest observations in each state, and the tally and names of HUCs with observations†. Names and dates are hyperlinked to their relevant specimen records. The list of references for all nonindigenous occurrences of Gasterosteus aculeatus are found here. Ecology: An enormous range of morphological variation is present within the threespine stickleback. There are two distinct varieties of the species, with one form having an anadromous existence and another form inhabiting strictly freshwater. The anadromous form spends most of its adult life in the ocean feeding on plankton and returns to freshwater to breed. The freshwater form inhabits a wide variety of lakes and streams, ranging from small, ephemeral streams, to large, permanently flowing water bodies, however it cannot exist in high gradient streams and is rarely found more than a few hundred meters above sea level. These freshwater populations are thought to have evolved from anadromous forms that were trapped in freshwater lakes during the last glacial melt (Bell et al. 1994). Within the freshwater variety, two morphological variations occur. One of these variations is known as the limnetic type, which is adapted to live in the water column of oligotrophic lakes and feed on surface plankton, and the other form is the benthic type, which inhabits the bottom of shallow eutrophic lakes or the littoral zone of deeper lakes and feeds from the lakebed (Bell et al. 1994, Mattern et al. 2007, Shaw et al. 2007). Breeding occurs annually from late April to July in ponds, rivers, lakes, drainage canals, marshes, sloughs, tidal creeks, and sublittoral zones of the sea (Bell et al. 1994, Mattern et al. 2007). Males are polygamous and attract several females into the nesting territory with zig-zag courtship dances over a 1- to 4-day period. The male will then fertilize all of the deposited eggs at one time and remain to guard them from predators and to ensure an ample oxygen supply (by fanning; Bell et al. 1994, Mattern et al. 2007). The eggs hatch 5 to 10 days after fertilization, and males stay with the newly hatched individuals for up to 2 weeks (Bell et al. 1994, Huntingford and Wright 1993). Individuals reach sexual maturity between 1 and 2 years of age. The average lifespan of this species is ranges is only about 1 to 3 years (Wootton 1976), with a maximum documented age of about 8 years in captivity (Bell et al. 1994). Gasterosteus aculeatus is a generalist carnivore, feeding on benthic invertebrates, including crustaceans and larval insects (benthic form), and zooplankton (limnetic form). It exhibits a predation cycle that consists of search, pursuit, attack, and capture. 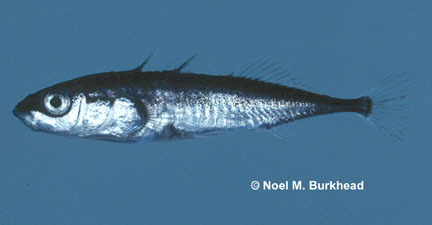 As the threespine stickleback is small, abundant, and a slow swimmer, it serves as a suitable prey for a wide variety of species. Natural predators include fish in the families Percidae, Esocidae, and Salmonidae, as well as avian piscivores such as loons, herons, and kingfishers. Macroinvertebrates, such as dragonfly naiads and beetles feed on eggs, fry, and juvenile individuals, and leeches are known to feed on eggs and adult individuals that are stuck in traps (Bell et al. 1994, Messler et al. 2007). To counteract predation, the stickleback exhibits shoaling behavior and relies heavily on chemical and olfactory pathways to detect predators and control shoal size and foraging activity (Mattern et al. 2007, Peuhkuri 1998). Means of Introduction: According to Miller and Hubbs (1969), the threespine stickleback was introduced into the Mohave River drainage of California between 1938 and 1940. The species was presumably introduced due to escape or release of baitfish brought in by anglers from southern California coastal area. In addition to the earlier releases, it was probably introduced into the Mohave River with trout from the Fillmore Hatchery in 1947 (Miller and Hubbs 1969). Gasterosteus aculeatus was believed to have been introduced into Gull and June lakes by anglers, probably from the Ventura River drainage, and it was introduced into the Santa Maria River system along with trout from the Santa Ynez River in 1940 (Miller and Hubbs 1969). A population in Holcomb Creek in the Mojave River drainage may have been introduced with trout in the late 1800s (Bell 1982, Sigler and Sigler 1987). According to Hartel et al. (1996), the population in Boston's Olmsted Park may have been introduced as part of a museum exhibit. The park contains a pool that Fredrick Law Olmsted had designated for a stickleback exhibit. The threespine stickleback was not known from above Niagara Falls before 1979. The first specimens collected from above the falls were taken in 1980 from South Bay in Lake Huron (Stedman and Bowman 1985). Smith (1985) stated that the threespine stickleback gained access to the Upper Great Lakes from the Ottawa River and Lake Ontario through the artificial Nipissing Canal. However, Stedman and Bowman (1985) presented the possibility that it was transported by bait dealers and subsequently released by anglers. Mandrak and Crossman (1992) recorded it from Thunder Bay, Lake Superior (Canada) and attributed its presence there to a ballast water introduction. Status: Reported in Ohio and Wisconsin, established in California, Massachusetts, and Michigan. A single fish was collected from the stomach of a lake trout taken in 150 feet of water southwest of Knife River in May 1996 (S. Geving, Natural Resource Specialist, Minnesota Department of Environmental Resources, pers. comm.). Also in May, two were collected in a commercial pound net in the St. Louis estuary under the Blatnik Interstate Bridge (S. Geving, Natural Resource Specialist, Minnesota Department of Environmental Resources, pers. comm.). First recorded in Lake Huron in 1982, where it apparently gained access through the Nipissing Canal from the Ottawa River (Smith 1985). During recent years, this species is reported as spreading rapidly throughout the upper Great Lakes (Burr 1991, Smith 1985). In June 1994 , this species was reported from Taconite Harbor, Lake Superior, Minnesota, where eight specimens were taken from cooling tower intakes (J. Gunderson, Sea Grant Extension Program, pers. comm., Hirsh 1998). It also has been reported from the Canadian side of Lake Superior (J. Gunderson, Sea Grant Extension Program, pers. comm.) It is now considered introduced and established in Lakes Erie, Michigan, Huron, and Superior (Roth et al. 2011). Impact of Introduction: Miller and Hubbs (1969) reported the stockings of armoured threespine stickleback G. a. microcephalus into the native range of the unarmoured threespine stickleback G. a. williamsoni in certain California drainages. One consequence has been extensive hybridization between the two subspecies (Miller and Hubbs 1969; Moyle 1976b). The three-spined stickleback is known to prey on eggs of other species (Page and Laird 1993). Remarks: The unarmored threespine stickleback G. a. williamsoni has been on the decline in California and has been listed as federally endangered since 1971. The population in Boston, Massachusetts is unique in several ways. It is the southernmost freshwater population, contains 3 distinct lateral-plate morphs, and it represents only the fourth record of low plate individuals. Its urban location is another factor in support of an introduction (Hartel et al. 1996). Hubbs (1919) advocated the stocking of G.aculeatus in natural and artificial water bodies in California as a biological control against mosquitoes. Gasterosteus aculeatus actually may represent a complex of two or more distinct species; subspecies have been proposed but their ranges are poorly defined (Miller and Hubbs 1969, Page and Burr 1991). Because the taxonomy of this group is so complex, it is probably irresolvable (Gilbert, personal communication). The potential for rapid evolution in G.aculeatus was exhibited following a 1982 chemical eradication program at Loberg Lake, Alaska, whereby the entire freshwater stickleback population was killed off with the intention of increasing lake resources for the trout and salmon populations. Following eradication, anadromous sticklebacks made their way back into the lake through the Cook Inlet. Within the next 12 years, the frequency of the armored (oceanic) form in this stickleback population dropped from 100% to 11%, replaced by an unarmored (freshwater) form which increased to a frequency of 75%, with some intermediate forms making up the remainder (Bell et al. 2004). Voucher specimens: Illinois (INHS 64211, 64481, 64482, 59309), Michigan (UWZM 8269), Minnesota (USGS-Biological Resources center, Ashland, WI; JFBM), Ohio (OSM), Wisconsin (UWZM 9093, 9094, 9727). Arme, C., and R.W. Owen. 1967. Infections of the three-spined stickleback, Gasterostelus aculeatis L., with the plerocercoid larvae of Schistocephalus solidus (Muller, 1776), with special reference to pathological effects. Parasitology 57: 301-314. Bailey, R. M., and G. R. Smith. 1991. Names of Michigan fishes. Unpublished mimeograph. 7 pp. Baker, J., S. Foster, and M. Bell. 1995. Armor morphology and reproductive output in threespine stickleback, Gasterosteus aculeatus. Environmental Biology of Fishes 44: 225-233. Bell, M.A. 1982. Melanism in a high elevation population of Gasterosteus aculeatus. Copeia 1982: 829-835. Bell, M., et al. 1994. The Evolutionary Biology of the Threespine Stickleback. New York: Oxford University Press. Bell, M.A., W.E. Aquirre, and N.J. Buck. 2004. Twelve years of contemporary armor evolution in a threespine stickleback population. Evolution 58(4): 814-824. Chappell, L.H. 1969. The parasites of the three-spined stickleback Gasterosteuis aculeatus L. from a Yorkshire pond. I. Seasonal variation of parasite fauna. Journal of Fish Biology 1: 137-152.
Cooper, A.R. 1918. North American Pseudophyllidean cestodes from fishes. Biological Monographs 4: 288-541. Cresko, W., K. McGuigan, P. Phillips, and J. Postlethwait. 2007. Studies of threespine stickleback developmental evolution: progress and promise. Genetica 129: 105-126. Czypinski, G. D., A. K. Hintz, M. T. Weimer, A. Dextrase. 1999. Surveillance for ruffe in the Great Lakes, 1999. U.S. Fish and Wildlife Service, Ashland, WI. 29 pp. Czypinski, G. D., A. K. Bowen, M. T. Weimer, A. Dextrase. 2001. Surveillance for ruffe in the Great Lakes, 2001. U.S. Fish and Wildlife Service, Ashland, WI. 36 pp. Day, T., J. Pritchard, and D. Schluter. 1994. A comparison of two sticklebacks. Evolution 48(5): 1723-1734. Ensembl. 2011. Genome browser 63: Gasterosteus aculeatus. (http://www.ensembl.org/Gasterosteus_aculeatus/Info/Index) Accessed: June 30, 2011. Geving, S.A. - Natural Resource Specialist, Minnesota Department of Environmental Resources, Duluth, MN. Letter to K. Schmidt dated June 6, 1996. Giles, N. 1983. Behavioural effects of the parasite Schistocephalus solidus (Cestoda) on an intermediate host, the three-spined stickleback, Gasterosteus aculeatus L. Animal Behaviour 31: 1192-1194. Godin, J.G.J., and C.D. Sproul. 1988. Risk taking in parasitized sticklebacks under threat of predation: effects of energetic need and food availability. Canadian Journal of Zoology 66: 2360-2367. Gunderson, J. L. - Sea Grant Extension Program, Duluth, MN. Memo dated 7 July 1994 to Aquatic Nuisance Species Outreach Contacts. Hartel, K.E., D.B. Halliwell, and A.E. Launer. 1996. An annotated working list of the inland fishes of Massachusetts. (http://www.mcz.harvard.edu/fish/ma_fam.htm) Accessed June 28, 2011. Hirsch, J. 1998. Nonindigenous fish in inland waters: response plan to new introductions. Minn. DNR Special Publication. 152: 1-21. Huntingford, F., and P. Wright. 1993. Behavioral Ecology of Fishes. Switzerland: Harwood Academic Press. Johnston, C. E. 1991. Discovery of the threespine stickleback (Gasterosteus aculeatus) (Pisces: Gasterosteidae) in the Lake Michigan drainage, Illinois. Transactions of the Illinois State Academy of Science 84(3&4):173-174. Latta, W.C. - Fisheries Scientist Emeritus, Michigan DNR. Response to NBS-G nonindigenous questionaire. 1992. Lester, R.J.G. 1971. The influence of Schistocephalus plerocercoids on the respiration of Gasterosteus aculeatus and a possible resulting effect on the behavior of the fish. Canadian Journal of Zoology 49: 361-366. LoBue, C.P., and M.A. Bell. 1993. Phenotypic manipulation by the cestode parasite Schistocephalus solidus of its intermediate host, Gasterosteus aculeatus, the threespine stickleback. American Naturalist 142: 725-735. Mandrak, N.E., and E.J. Crossman. 1992. Postglacial dispersal of freshwater fishes in Ontario. Canadian Journal of Zoology 70: 2247-2259. Mattern, M., D. Kingsley, C. Peichel, J. Boughman, F. Huntingford, S. Coyle, S. Ostlund-Nilsson, D. McLennan, B. Borg, I. Mayer, M. Pall, I. Barber, and I. Katsiadaki. 2007. Biology of the three-spined stickleback. Boca Raton: CRC Press. McPhail, J.D., and S.D. Peacock. 1983. Some effects of the cestode (Schistocephalus solidus) on the reproduction in the threespine stickleback (Gasterosteus aculeatus): evolutionary aspects of a host-parasite interaction. Canadian Journal of Zoology 61: 901-908. Meakins, R.H. 1974. A quantitative approach to the effects of the plerocercoid of Schistocephalus solidus Müller 1776 on the ovarian maturation of the threespine stickleback Gasterosteus aculeatus L. Zeitschrift fur Parasitenkunde 44: 73-79. Meakins, R.H., and M. Walkey. 1975. The effects of parasitism by the plerocercoid of Schistocephalus solidus Muller 1776 (Pseudophyllidea) on the respiration of the threespine stickleback Gasterosteus aculeatus L. Journal of Fish Biology 7: 817-824. Messler, A., M. Wund, B. John, and S. Foster. 2007. The effects of relaxed and reversed selection by predators on the antipredator behavior of the threespine stickleback, Gasterosteus aculeatus. Ethology 113: 853-863. Milinski, M. 1985. Risk of predation of parasitized sticklebacks (Gasterosteus aculeatus L.) under competition for food. Behaviour 93: 203-216. Milinski, M. 1990. Parasites and host decision-making. Pages 95-116 in C.J. Barnard and J.M. Behnke, editors. Parasitism and host behaviour. Taylor and Francis, London. Miller R. R., and C. L. Hubbs. 1969. Systematics of Gasterosteus aculeatus with particular reference to intergradation and introgression along the Pacific Coast of North America: a commentary on a recent contribution. Copeia 1969(1):52-69. Morrow, J.E. 1980. The freshwater fishes of Alaska. University of British Columbia Animal Resources Ecology Library. 248p. Muus, B.J., and J.G. Nielsen. 1999. Sea fish. Scandinavian Fishing Year Book, Hedehusene, Denmark. 340 pp. Page, L. M., and C. A. Laird. 1993. The identification of the nonnative fishes inhabiting Illinois waters. Report prepared by Center for Biodiversity, Illinois Natural History Survey, Champaign, for Illinois Department of Conservation, Springfield. Center for Biodiversity Technical Report 1993(4). 39 pp. Pascoe, D., and D. Mattey. 1977. Dietary stress in parasitized and non-parasitized Gasterosteus aculeatus L. Zeitschrift fur Parasitenkunde 51: 179-186. Peuhkuri, N. 1998. Shoal composition, body size and foraging in sticklebacks. Behavioral Ecology and Sociobiology 43: 333-337. Reimchen, T.E. 1982. Incidence and intensity of Cyanthocephalus truncatus and Schistocephalus solidus infection in Gasterosteus aculeatus. Canadian Journal of Zoology 60: 1091-1095. Ridler, K. 2004. Foreign fish invading reservoir. (statesmanjournal.com) April 19, 2004. Scheidegger, K. - Bureau of Fisheries Management, Madison, WI. Response to NBS-G non-indigenous questionaire. 1992. Scott, W.B., and E.J. Crossman. 1973. Freshwater fishes of Canada. Bulletin of Fisheries Research Board of Canada 184: 1-966. Shaw, K., M. Scotti, and S. Foster. 2007. Ancestral plasticity and the evolutionary diversification of courtship behavior in threespine sticklebacks. Animal Behaviour 73: 415-422. Sigler, W.F., and J.W. Sigler. 1987. Fishes of the Great Basin: a natural history. University of Nevada Press, Reno, NV. 425 pp. Smith, R.S., and D.L. Kramer. 1987. Effects of cestode (Schistocephalus sp.) on the response of ninespine sticklebacks (Pungitius pungitius) to aquatic hypoxia. Canadian Journal of Zoology 65: 1862-1865. Smyth, J.D. 1962. Introduction to animal parasitology. Thomas, Springfield, Illinois. Stedman, R.M., and C.A. Bowen. 1985. Introduction and spread of the threespine stickleback (Gasterosteus aculeatus) in Lakes Huron and Michigan. Journal of the Great Lakes Research 11: 508-511. Swift, C.C., T.R. Haglund, M. Ruiz, and R.N. Fisher. 1993. The status and distribution of the freshwater fishes of southern California. Bulletin of the Southern California Academy of Science 92(3): 101-167. Walkey, M., and R.H. Meakins. 1970. An attempt to balance the energy budget of a host-parasite system. Journal of Fish Biology 2: 361-372. Wedekind, C. 1997. The infectivity, growth, and virulence of the cestode Schistocephalus solidus in its first intermediate host, the copepod Macrocyclops albidus. Parasitology 115: 317-324. Wootton, R.J. 1976. The Biology of the Sticklebacks. Academic Press, New York, NY. Wootton, R.J. 1984. A Functional Biology of Sticklebacks. University of California Press, Berkeley and Los Angeles.